Trump's knife crime claim: how do the US and UK compare? Donald Trump has sought to defend the use of guns in the US by drawing a parallel with knife crime in London. The US president, addressing the National Rifle Association, claimed a London hospital had become overwhelmed with victims of knife attacks. So, how does the US and the United Kingdom compare when it comes to gun and knife crime? We looked at murder rates from both weapons over a five-year period. London suffered a spike in knife crime in the early part of this year, and the total number of murders during February and March exceeded that in New York. "Some of my military colleagues have described their practice here as being similar to being at Bastion," he said. "About a quarter of what we see in our practice is knife and gun injury. And it's now we're doing major life-saving cases on a daily basis." But on Saturday he implied Trump had drawn the wrong conclusion from his remarks, saying on Twitter that he would be happy to invite Trump to his "prestigious" hospital to discuss London's efforts to reduce violence. "There is more we can all do to combat this violence, but to suggest guns are part of the solution is ridiculous,” said Professor Karim Brohi, trauma surgeon at the Royal London Hospital. “Gunshot wounds are at least twice as lethal as knife injuries and more difficult to repair." 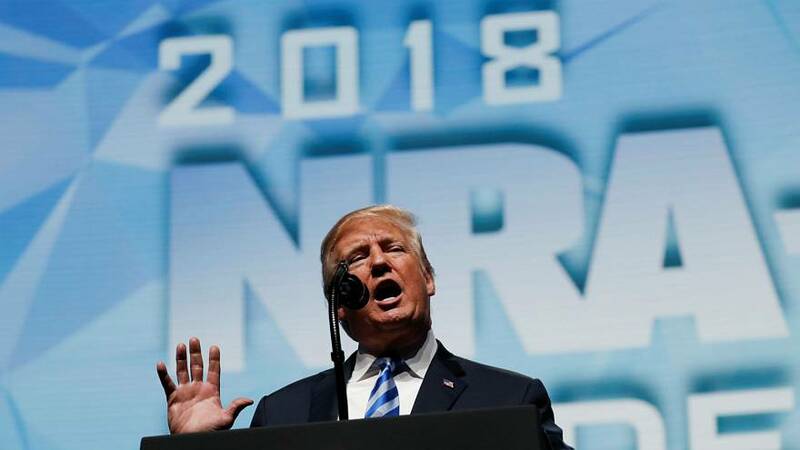 Trump's NRA speech also drew anger in France on Saturday, after the US president, using his hand in a gun gesture, acted out how a gunman had killed hostages one by one during an attack in Paris in November 2015. Trump said a civilian could have stopped the massacre at the Bataclan concert hall, where 90 of the 130 victims of the attack died, had they had a gun. Former French president Francois Hollande, who was head of state at the time, said on Twitter that Trump's comments and antics were "shameful" and "obscene". Donald Trump's shameful and obscene remarks says a lot about what he thinks about France and its values. The friendship between our two people will not be tainted by disrespect and excessiveness. All my thoughts to the victims of November 13.